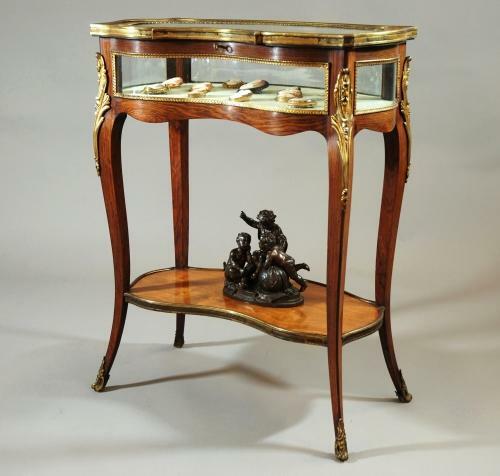 A French late 19thc Kingwood bijouterie table of fine quality & small proportions. This highly decorative table is an unusual shape, the front being of an inverted serpentine shape, the back & sides being a serpentine shape. The bevelled glass lid has a decorative ormolu moulding surrounding it & it has a plain ormolu moulding with a reeded decoration framing the lid. There is a key to lock the table with. The interior has a pale green fabric at present but this could easliy be changed to a fabric of your choice. Each of the front, back & side shaped glass panels is framed with the same decorative ormolu moulding. Each of the rails is shaped & at the top of each leg is a good quality ormolu mount of a foliage design. The tapering cabriole legs terminiate with an ormolu mount and there is a central shelf at the bottom. The bronze & cameos are for photographic purposes only & are not included in the price listed. This table is of very good condition & stable construction.